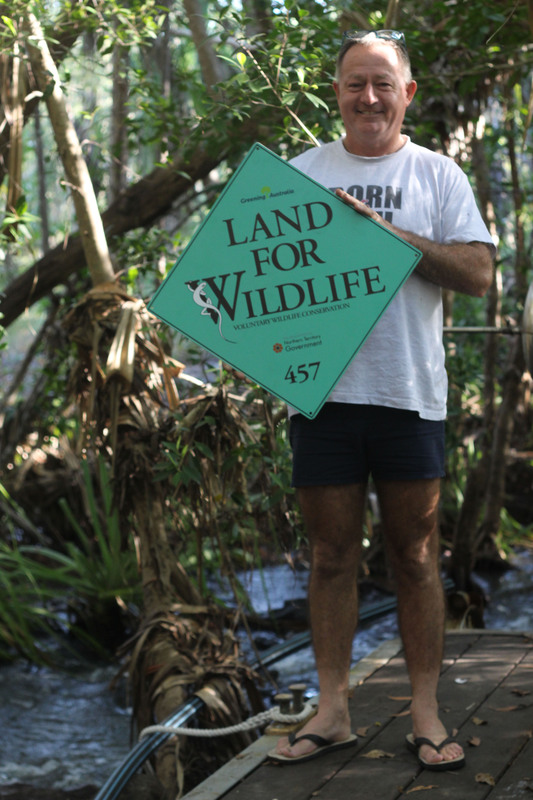 Last year Shayotte and Mark pledged their little piece of paradise as Land for Wildlife habitat. Their property encompasses a large amount of the magical and fairy like Sand Sheet Heath. They have lived on this little bit of landscape for 15 years, which is 6.1 hectares (13.4 acres) and encompasses 4 hectares of Howard Sand Sheet and is adjacent to another large and beautiful section of Sand Sheet to the West of The Humpty Doo Golf Course. 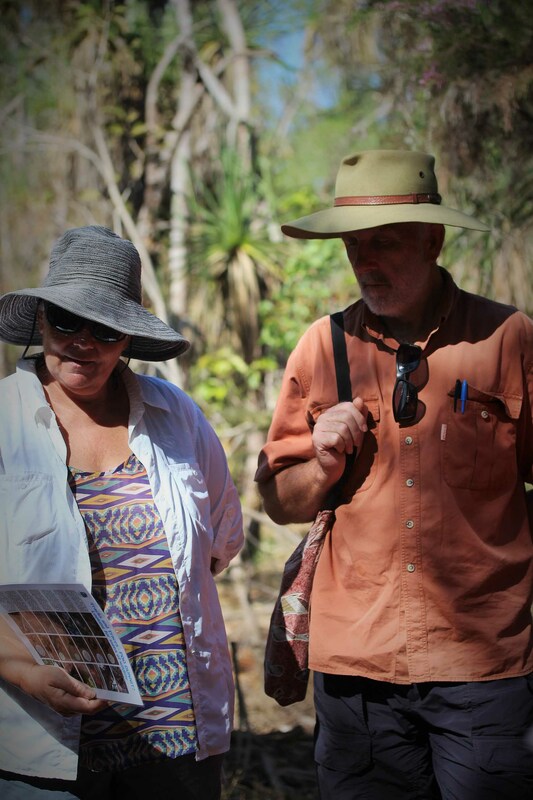 Shayotte and Mark love the Top End landscapes, and the incredible wildlife. They feel Humpty Doo is changing, with less people respecting the landscape and management issues include more wild dogs getting onto to their property. They have constant wonder for the plant and animal species, especially those in the Sand Sheet and have battled nearby properties who want to drain it – imagine that! A few years ago a hot fire burnt through which devastated them, but a lot of the Verticordias which were stumped for so long have flowered beautifully for the first time. I can’t wait to revisit in the wet and check out the flowering plants, particularly the Utricularias. As the rain falls and new life flushes our wonderful landscapes a rich green colour, one special life has left our landscape. Here’s to Strider, an inspirational thinker, environmental activist, outspoken and quirky character and a friend to many. I hope some of his incredible love for our native landscapes, plant knowledge and social justice lives on with others. His detailed observations of changing seasons and ecological nuances of his home and the land he cared for underlined an in depth relationship that others can only aspire to. He was always dedicated to learning about the place we live and trying to protect it with a lust for life and people. May your onward journey be smooth and our landscapes continue to have people that connect with them and protect them and share their wonder with others. Here’s to those who inspire and do not always conform. 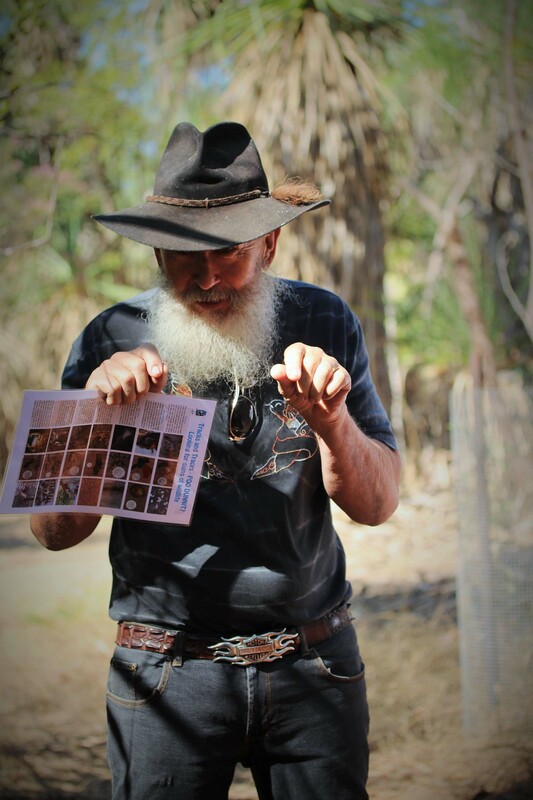 Strider acquainted me with numerous Top End plants and stories to go with them, he really was my first teacher of our amazing landscapes here in the Top End. I spent a lot of time in his company walking our landscapes with him, discussing, listening and enjoyed his insight and passion into life. I, as many others, were blessed to have his time and stories and observations. I hold with me some of these and hope I can remember them. I have so much respect that he stood up for what he believed in, and was never bent in to conform in certain ways that many of us do; he observed so much with great intent. I was recently working with Strider to produce an article about observations and recent fire on his (Land for Wildlife) block which had not previously been purposefully burnt since 1979 to go into the Land for Wildlife Newsletter. I visited him regularly as he became unwell at the solar village, but amongst dinners and other conversations not all the details of the fire story are yet complete, but I will try my best for our upcoming newsletter and leave you with a couple more of the photos that were taken for the article and a few pearls of wisdom. 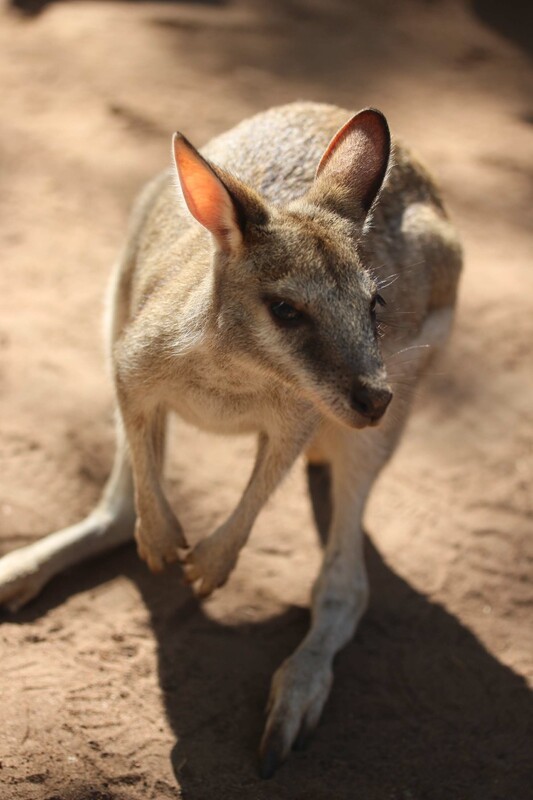 Just recently the Land for Wildlife program hosted a members’ workshop in partnership with the Territory Wildlife Park with a focus on wildlife, in particular mammals. Above are just some of the 37 participants we managed to grab at the end to pose for a photo. It was a really good day, where members got to meet each other, learn from some presenters, very experienced in wildlife handling or research and some of the animals themselves. 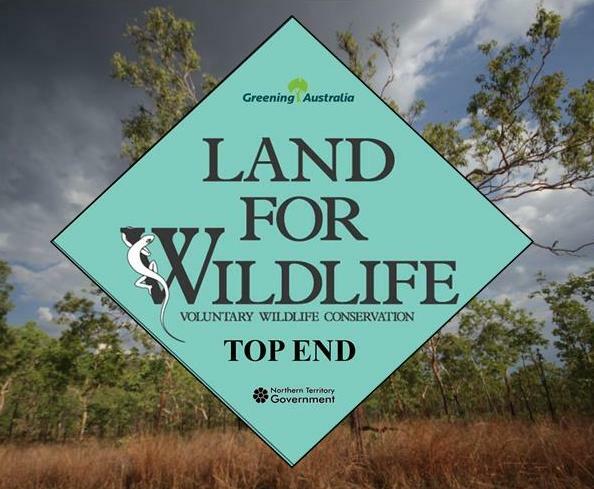 The workshop was designed for land mangers signed up to the program to find out more about the mammals likely to be found on their properties, their habitats and food sources and how best to manage landscape for them. It is well known that mammal (and reptile) numbers have declined in the region and across northern Australia. 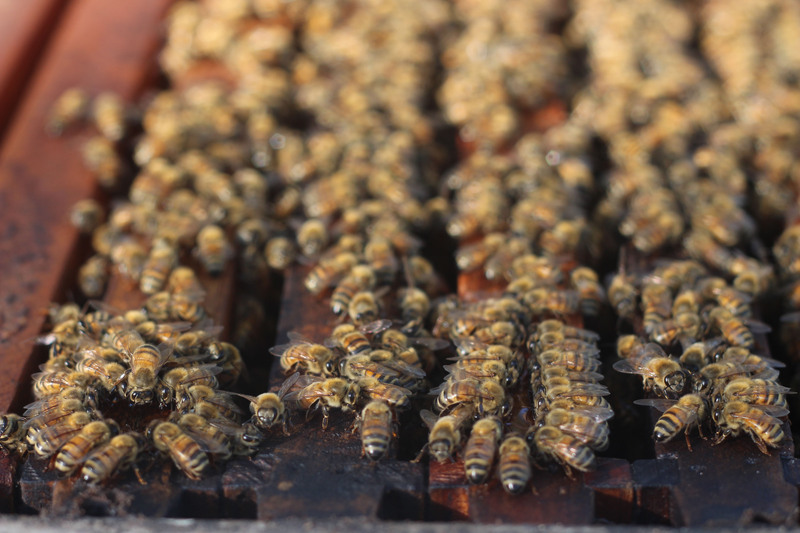 There is a lot of research carried out to find out exactly why, but there are some basic management practices that enhance habitat and protect fauna. There are 50 species of mammals in the Darwin Region and over 80 species of reptiles, including lizards, snakes, turtles and frogs. Some of the most common mammals found in the Darwin region are the Agile Wallaby, the Common Brush Tail Possum and the Northern Brown Bandicoot and the flying fox and other bats. Many mammals have decreased in numbers over the last 20 years including the Northern Quoll and Black footed Tree Rat. 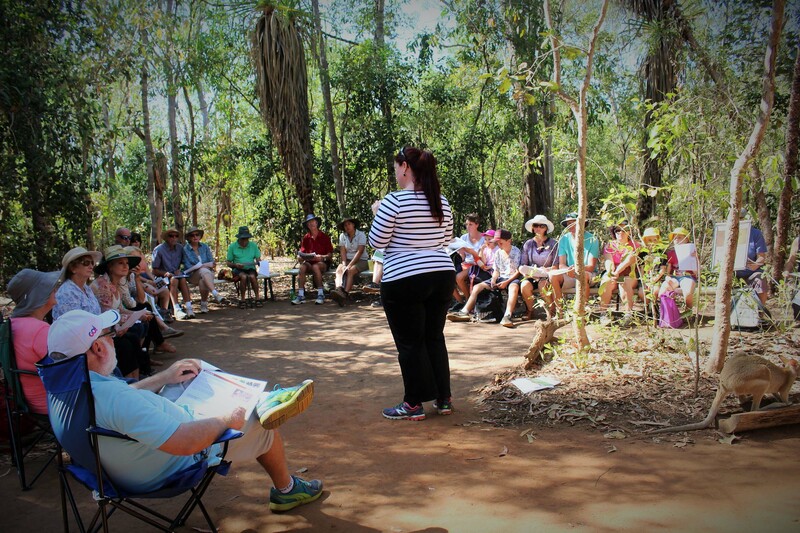 The workshop started with a quick introduction to the Territory Wildlife Park and its function in environmental education and conservation. The park actually encompasses more land than just the area in exhibits, which is vast anyway and encompasses many landscape types. 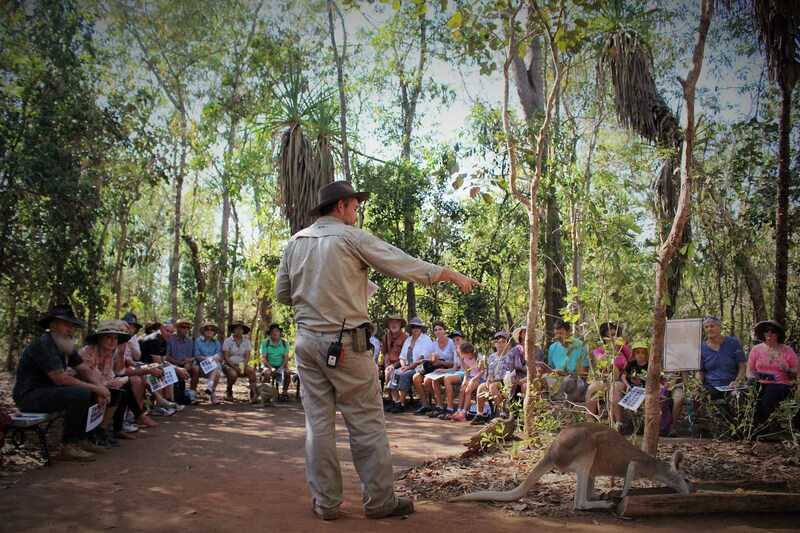 The Territory Wildlife Park is a Land for Wildlife member and partner and has a focus on Wildlife education, housing an array of native Top End species within their natural setting. 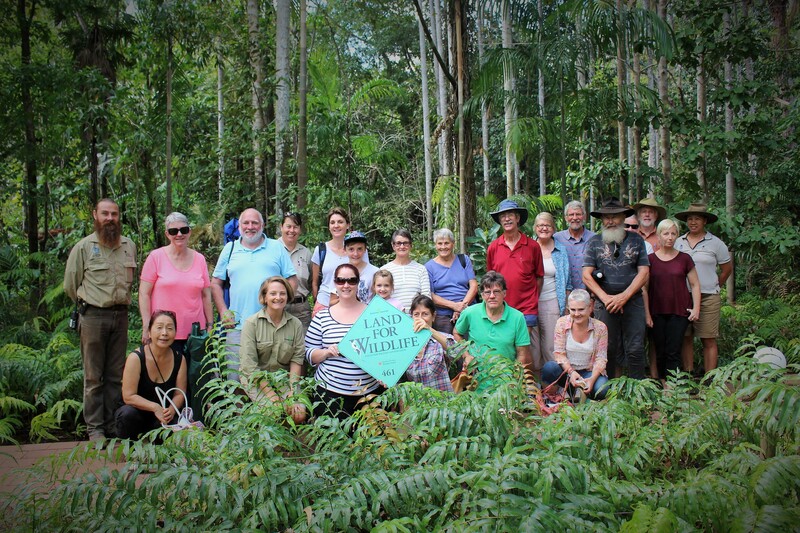 Participants then took a lovely dry season stroll through the mixed woodland area, lined with Turkey Bush and into the woodland walk area which is home to many tame Wallabies that have been taken in after being rescued, often after being found in the pouches of mothers hit by cars. 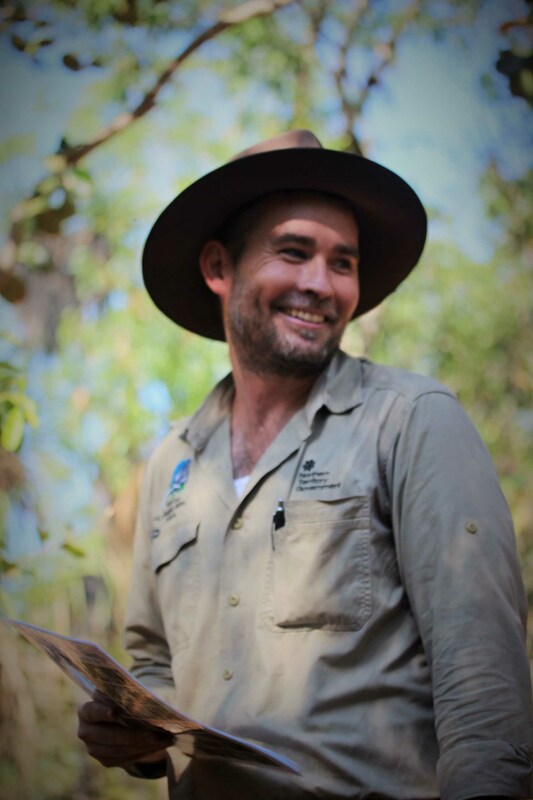 Park keeper Rob Mcgregor met us in the area and gave an informative talk about the mammals in the Top End , their distribution, behaviours and habitats, while some wallabies joined the discussion. Most mammals are active at night, so the best way to spot them is by spotlighting. Even if you try some are shy and very small, so the next best way is to be able to recognise their scats. We looked at an array of samples and matched them to common mammals (and pests) found on rural properties. To see a copy of this, click here. 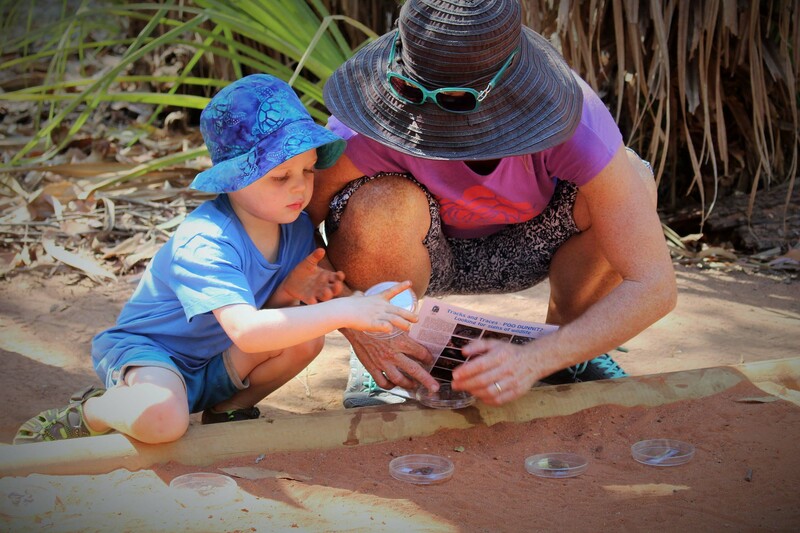 LFW Member KAte Kilgour and her son examine mammal scats, an easy way of detecting what species are in the landscape. Land for Wildlife member Kevin Maxwell describes the behaviour of mammals on his property (with some great hand actions) and other members discuss mammals seen on their block. 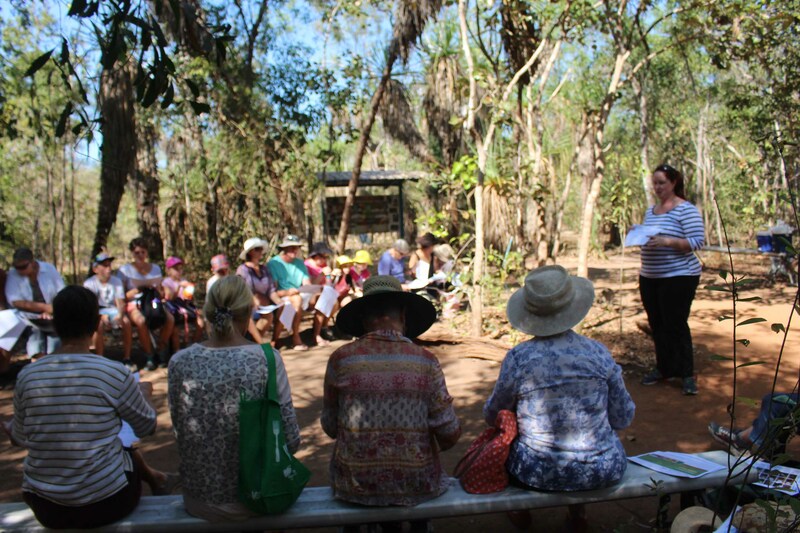 After this great hands on (poo) activity, members exchanged stories of different species on their blocks and then Brooke Rankmore of Greening Australia gave a presentation. 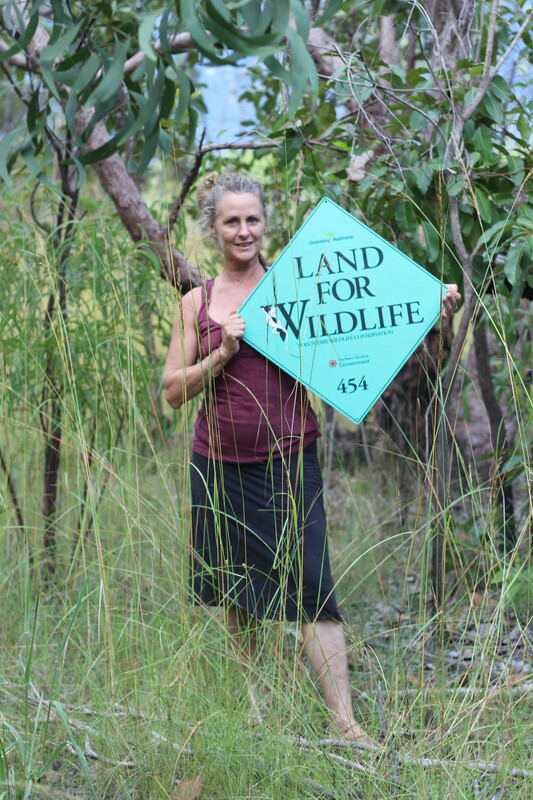 Brooke had carried out a PHD in Land Fragmentation in The Top End. 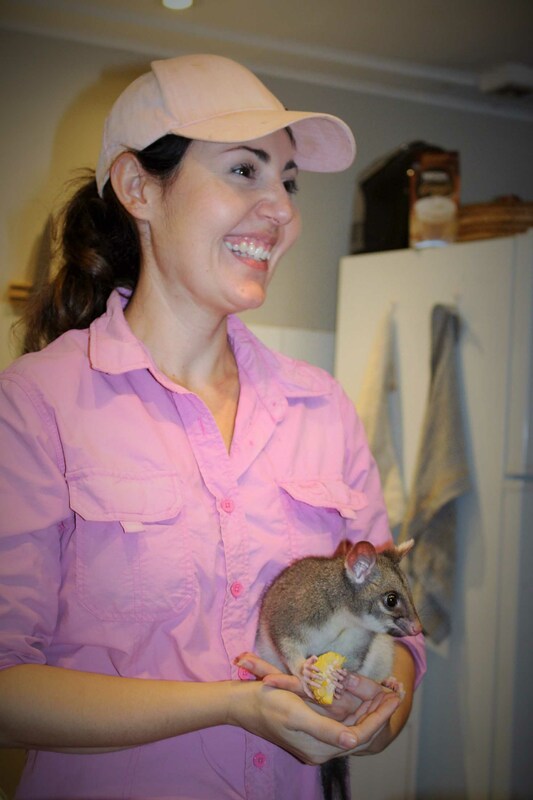 This was a few years ago, but she found that many mammal species were more plentiful in the rural area than in Kakadu at the time. Some of this she attributed to firebreaks and the absence of fire in areas in subdivisions. Brooke described the species of mammals that are now in decline and listed at an NT level. You can find that list here. We are working on more fact sheets in Land for Wildlife that cover many more fauna species that are also more common. All the participants then were lucky enough to have their own personal Territory Wildlife park guide through the nocturnal house to look at live exhibits of the mammals and some reptiles including The Black footed Tree Rat, the Water rat, the Northern Brown Badicoot and Common Brushtail Possum (pictured above in the hands of a volunteer). 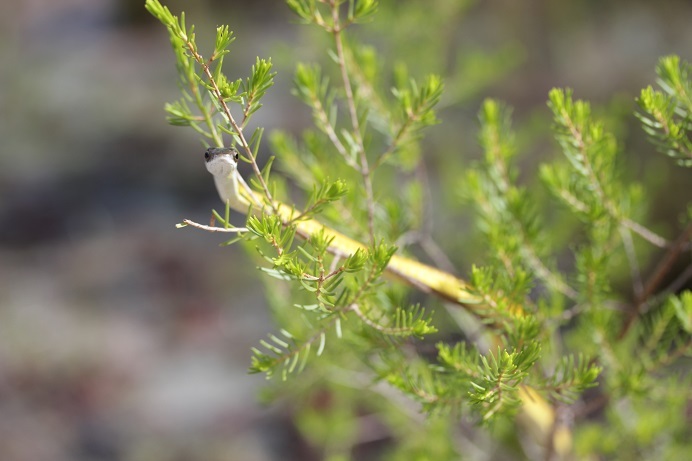 A site set up by The fauna division of DLRM that allows some “Citizen Science” and for landholders, or others to register and upload their native fauna sightings to the data base,. Here the records will be held and can be accessed. To be involved you just need to set up a password and user name. 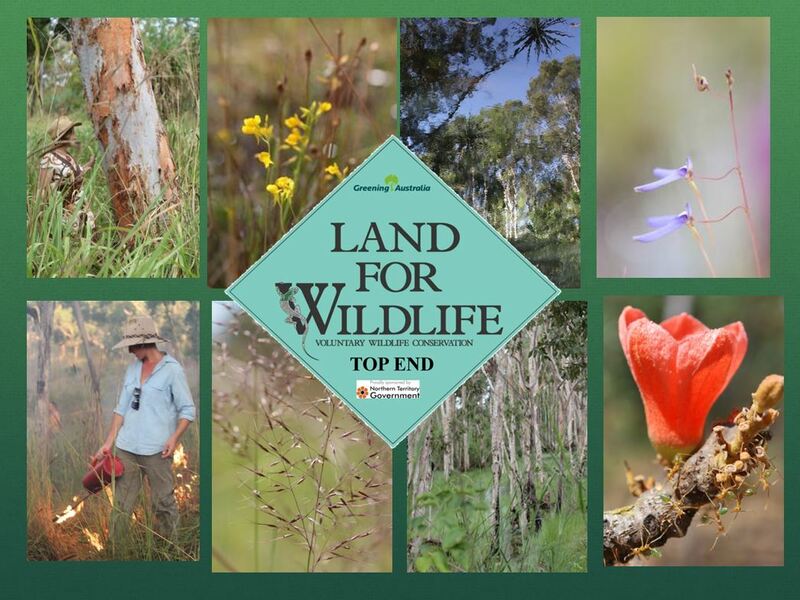 If you would like more information contact us at Land for Wildlife or Brydie at DLRM. 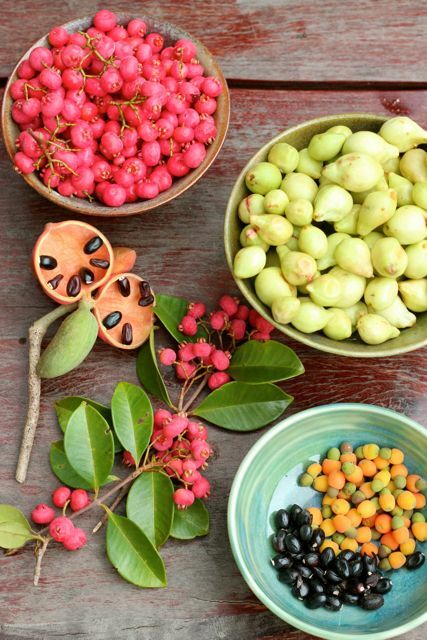 Infonet is a resource that has been developed with Territory Natural Resource Management and Charles Darwin University. It is a program that allows you to select an area of land on a map and generate reports about it. The reports can include as much or as little information as you wish on Soil, Flora and Fauna species, listed species, weed species, fire history and Wildlife Management. This is really quite easy to use, generates a useful and very professional looking report and is very useful for land managers. If you are interested in a small area of land (under 50 hectares) it is best to draw a larger boundary or give the area a buffer zone as the reports of species are made on held records and sightings which are not taken from every bit of land. NR Maps is a mapping program holding different layers of Government information. If you like maps you will love this, although it is a little slow and you cannot hold your place yet. There is a side bar to the left which allows you to turn off and on different layers, including some vegetation, mining tenements and leases and Cadastre. Cadastre is who owns (or manages parcels of land). It will not tell you the name of private landholders, but will tell you whether the land is private, Vacant Crown Land, Pastoral or otherwise, how it is divided up and the size of each portion of land and its assigned portion number. This is really handy if you are wanting to know who is managing neighbouring land. If it is local council you can contact them with management issues. NAFI stands for Northern Australian Fire Information. It allows you to track fires, look up fire history and fire scars and generate reports. You can see when early or late fires are and the late ones (August on) are definitely not prescribed burning and detrimental to our landscapes and wildlife. I hope these tools are useful and the information on mammals. Our next wildlife workshop series will focus on birds, insects and more reptiles. We would also like to encourage any members with knowledge to share this with others and help present some low key workshops or talks on there blocks. Get in touch! 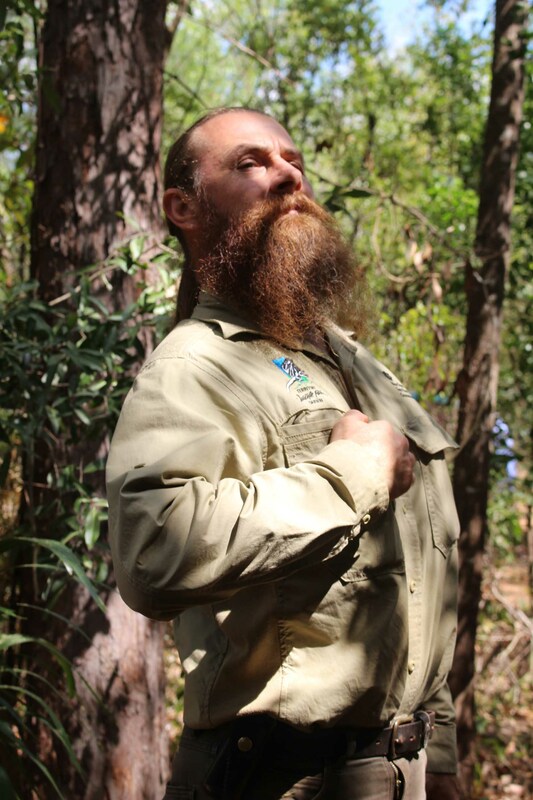 Thanks again to all the amazing Territory Wildlife Park staff, including Damien, Rob, Sarah and Jasmine and also presenters Brooke and Brydie. If you are member of Land for Wildlife we would like to hear from you! We want to know what you think of the program and what you would like to see included. 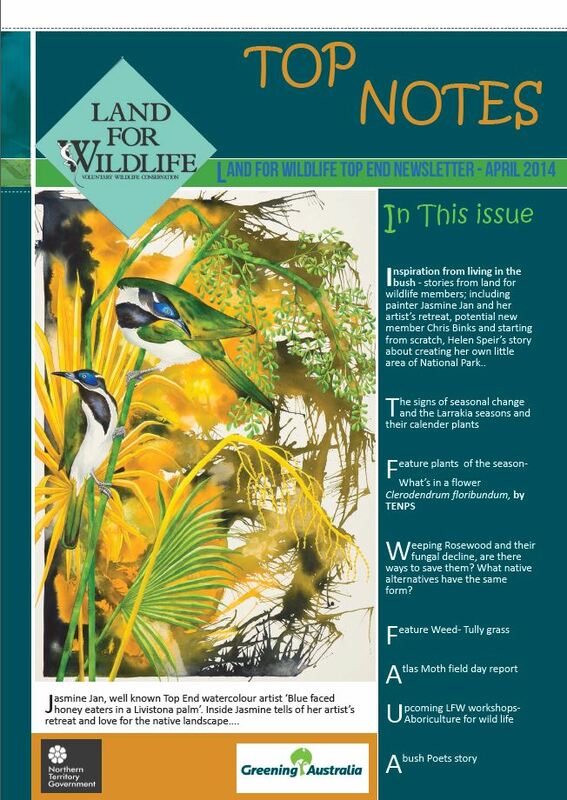 Land for Wildlife Mid Year Newsletter out now! Check out our newsletter- it was released just before Christmas and has some fantastic stories from members or more. If you haven’t seen it click below on the front page. There are heaps more great stories archived in the newsletter area of the website. We look forward to more exciting happenings this year and new members! We are pleased to share this Land For Wildlife blog site with you, where newsletters, relevant information, land management tips and techniques, events and members stories can be posted. All past newsletters can be found under the newsletter tab- just double click on the picture of the front page of the newsletter you wish to open.